We have had several questions in regard to the skin condition known as Ichthyosis. Many families are unsure as to what it means to have adult dogs that are carriers, clear, or affected and how does this affect the puppy they are getting. 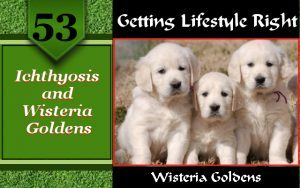 Golden Retriever Ichthyosis is an inherited autosomal recessive trait. This condition produces a “white” looking dandruff and progressively turn darker blackish in color. The complications arise IF the dog obtains a secondary infection due to the dry scaly skin. While there are no known treatments at this time, providing a high-quality diet and skin supplements can keep the symptoms at a minimum or completely clear. None of our puppies will ever have Ichthyosis, even though we have females that are affected. We do the DNA testing on our adults to know if they have a mutated ICT-A gene that produces Ichthyosis, so we are aware how we can pair them for breeding. Since both of our males, Ego and Thor are clear, the most any of our puppies will ever be are carriers. The puppy must have two affected genes in order to ever have the skin condition. Each dog has two ICT-A genes. If both of these genes are clear then the dog does not have Ichthyosis and will not produce a puppy that does. If one gene is affected, then the dog is considered a carrier and when bred will provide either the clear gene or the affected gene to their offspring. (Each parent contributes one gene to the puppy) If both genes are affected the dog has ichthyosis. A dog can have Ichthyosis and have no physical symptoms or appearance of it, which is why the testing is important.